The biomaterials sector is rapidly expanding and significant advances have been made in the technology of biomedical coatings and materials, which provide a means to improve the wear of joints, change the biological interaction between implant and host and combine the properties of various materials to improve device performance. Coatings for biomedical applications provides an extensive review of coating types and surface modifications for biomedical applications. 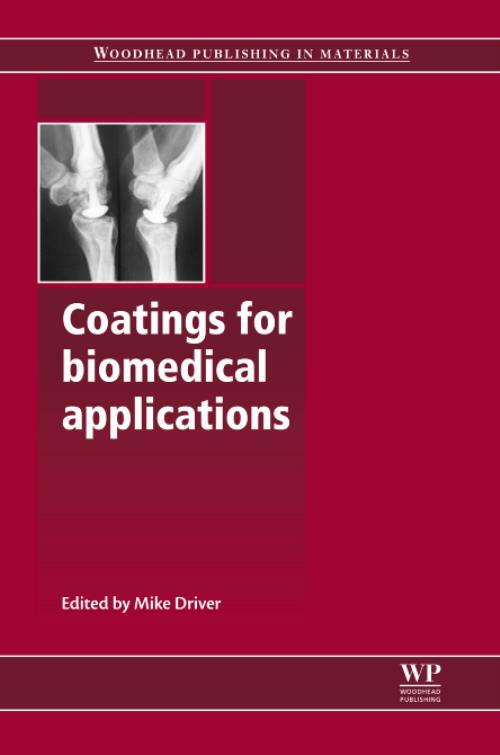 The first part of the book explores a range of coating types and their biomedical applications. Chapters look at hydrophilic, mineral and pyrolytic carbon coatings in and ex vivo orthopaedic applications and finally at surface modification and preparation techniques. Part two presents case studies of orthopaedic and ophthalmic coatings, and biomedical applications including vascular stents, cardiopulomonary by-pass equipment and ventricular assist devices. With its clear structure and comprehensive review of research, Coatings for biomedical applications is a valuable resource to researchers, scientists and engineers in the biomedical industry. It will also benefit anyone studying or working within the biomedical sector, particularly those specialising in biomedical coatings. Driver, MikeMike Driver is Biomaterials Business Director at Vertellus Specialties UK Ltd. He has been instrumental in the development of new materials for contact lenses and biocompatible coatings for medical devices.